Marquee Wedding Furniture - Which Chair Do You Choose? When it comes to choosing your wedding furniture for your marquee then there are several styles of chairs and tables to choose from. Furniture sets the scene for your reception and it is key that we offer you designs and styles that will work with your chosen look. Chairs, particularly, tend to follow a bit of a trend – what’s popular now may be superseded by a new design/style in a few years. So what are the choices? We are now delighted to be able to introduce a NEW chair to our range and we have searched far and wide, high and low to get the right look and feel pretty sure that bride and grooms are going to LOVE them! So let us introduce you to our new Cross Back Dining Chair – whoop whoop! It is a lovely style and fits so well with that understated vintage, country or beach style. 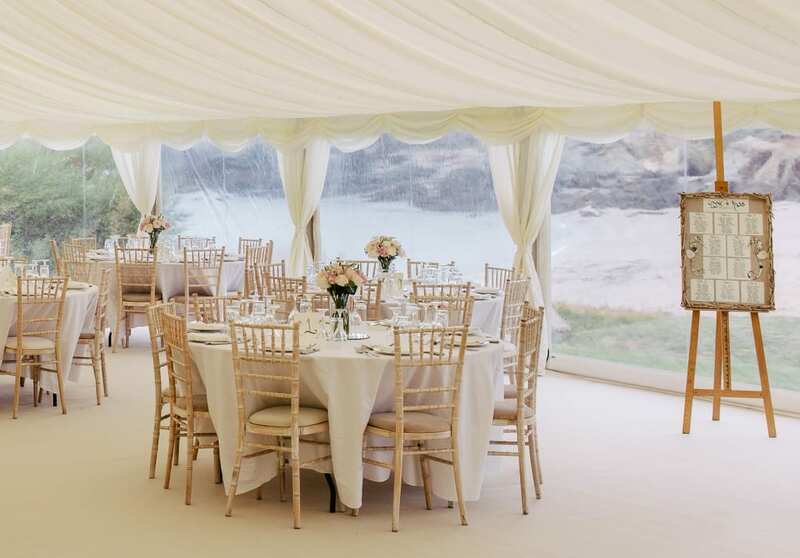 Providing marquees to sites throughout Devon and Cornwall, which take in some of the most stunning beaches and beautiful countryside, we think they will fit perfectly with the scenery and our brides and grooms chosen themes. To get more of a feel for how they look in a real setting take a look at our pinterest page – they are so brand new that we don’t have any photos ourselves as yet! You can also follow us on facebook and instragram – as soon as we have photos we will post them. 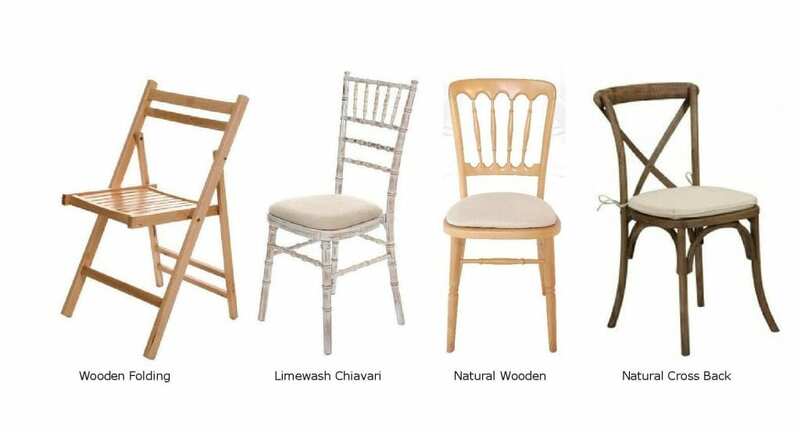 Limewash Chiavari Chairs have been popular for a few years and continue to be so – they are stylish and work effortlessly in a formal marquee or with a rustic shabby chic look. 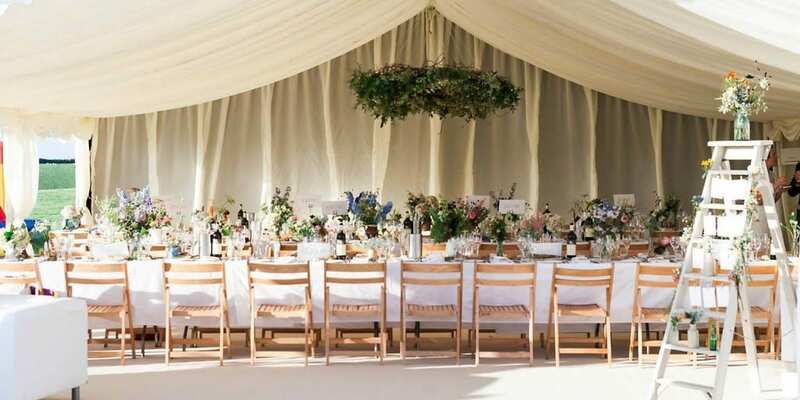 Likewise we have seen a great revival in the use of the Folding Wooden Chairs, particularly when bride and groom’s wanted a less formal or vintage look. Natural Wooden Banqueting Chairs continue to be a firm favorite…and work perfectly for formal or informal occasions. Generally people opt for our ivory seat pads as they provide a neutral colour working well with any chosen scheme but if you want to add a bit of colour to the chairs then we can supply a variety of seat pad options. What ever you choose will be perfect for your day! For more ideas on decorating wedding marquees take a look at our pinterest pages – there are a load of pictures just waiting to inspire you!